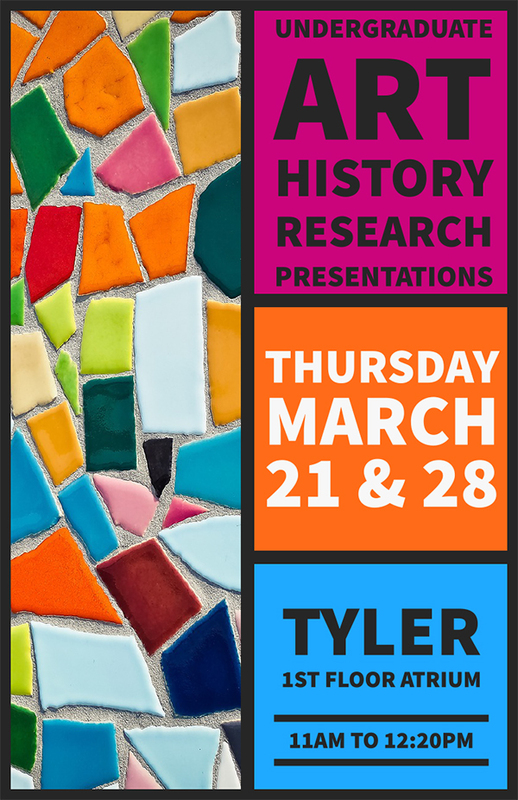 In conjunction with Tyler’s Annual Undergraduate Show, come and hear what the undergraduate Art History students have been working on! These pop-up talks are held in the Tyler Lobby (atrium by Admissions) on Thursday, March 21 and Thursday, March 28 from 11 am – 12:20 pm. Please join us for Temple University’s 13th Annual Global Temple Conference on Wednesday, April 3rd, 2019. The conference is an excellent opportunity for you to become more involved in Temple’s globalization mission and to experience the variety and quality of international work produced by Temple students, faculty and staff. The conference will feature panel and poster sessions focusing on a wide range of topics and world regions, and a global resource fair. U.S. World Policy: America First vs. Global Diplomacy, featuring Ignazio Marino, former Mayor of Rome and member of the Italian Senate, and Senior Vice President, Professor of Surgery, Jefferson University; and Trudy Rubin, foreign affairs columnist and editorial board member for the Philadelphia Inquirer. All sessions and the lecture are free. Conference registration is not required, but please R.S.V.P. to attend the lecture. Please join us as your schedule permits and encourage your students to attend; they will be inspired and informed by the research their peers are conducting. If you would like to give extra credit for attendance, please let us know and we will provide sign-in sheets for your students. Want to learn more? Come to one of the information sessions or walk-in hours during Fulbright Week, March 25-29. If you don’t which type of Fulbright interests you, come to one of the Overview sessions. All sessions are in Tuttleman Learning Center 201. Tyler’s last free field trip will go to New York City for the AIPAD Photo Show on Saturday, April 6. The bus will leave from 13th & Diamond Streets at 9 am sharp and return around 7:30 pm. If you don’t want to go to the Photo Show, the bus will make a stop at 55th and 8th Streets in midtown Manhattan (north end of the Times Square area, about 3 blocks from the Museum of Art and Design and 7 blocks from the Museum of Modern Art). The bus trip is free. Tickets to AIPAD are $20 for students. You may do anything you like in NYC. You must be back at 55th & 8th St (morning drop off location) at 4:45 pm OR Pier 94 (AIPAD show) at 5 pm to board the bus; otherwise, you will be left behind. If you require a wheelchair-accessible bus, you must register and email miss.kari@temple.eduno later than 4 pm on Friday, March 29 so a wheelchair-accessible bus may be ordered. You may only register once–if you have a friend who wants to go, they need to be logged into their email account–if you try to register a friend your registration will be overwritten. If you find you can’t go, please email miss.kari@temple.edu to cancel your registration so someone from the waiting list will be able to go. Only the first 54 people can come, after that, you will be placed on the waiting list. Assume you are registered for the trip unless you hear from me within 48 hours. You probably heard that there’s a gender pay gap; women typically earn 80% of what men earn. And it’s not just that men and women choose different jobs, with women typically choosing lower-paying professions; female registered nurses, an occupation that’s overwhelmingly female-dominated, earn only 92% of what male registered nurses earn! This is a persistent problem throughout the American work force, and it needs to be addressed. It has not changed much despite other changes in diversity in the last several years. The statistics are even worse for men and women of color. Often this is because women don’t negotiate their salaries when they get new jobs. We are hoping to address this by offering a workshop to give students tools they need to negotiation their starting salaries in their first jobs after college. 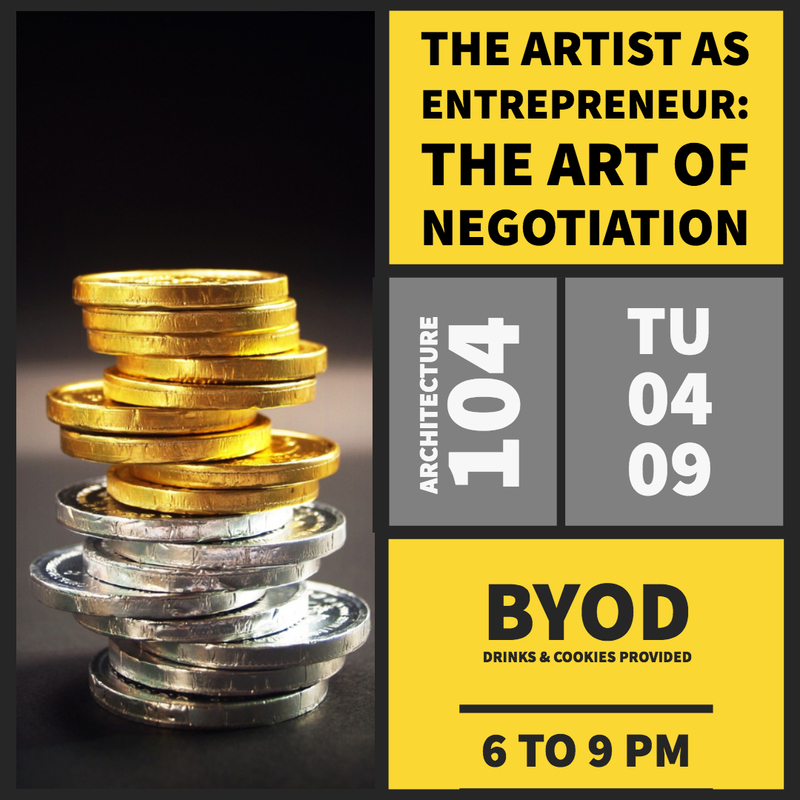 On Tuesday, April 9, Tyler and TFMA will be co-sponsoring a Creative Salary Negotiation Workshop at 6 pm in Architecture 104. This will be an active, experiential workshop. You are welcome to BYOD (bring your own dinner); we will provide coffee, tea, hot chocolate and cookies. This workshop is designed to acquaint students with the basics of salary negotiation, specifically geared to those seeking creative careers. Learn the secrets to figuring out how much you need to earn to survive, what your skills/experiences are worth in the marketplace and how to successfully negotiate a fair salary/rate. All students (both men and women) are invited to attend regardless of major. This is geared towards creative careers and freelancing will be addressed. Please REGISTER HERE so we know you’re coming and have a workbook for you! Organized by Tyler Graduate Student Austen Weymueller with a grant from Tyler’s Interdisciplinary Fund, this is an opportunity to share your practice/work/research with a small group of faculty and students from different disciplines, and provide one another with feedback, questions, knowledge, and resources. It is intended to be a casual conversation where you can gain perspectives on your practice from outside your own discipline, give insight to others, and find future collaborators. 2 hours during an evening. Each will be located in different buildings around the Temple campuses, coinciding with the department of the faculty member. Dinner will be provided! Sign up to participate in one or all of the sessions here. Within the overarching topic of Memory & Cognition, we will be looking at the ways in which humans process abstract images and concepts. Does your work concern the use of symbols/symbolism as descriptors or signifiers, abstract imagery, cognition linking language and image, the role of memory in understanding a present moment? Please bring your voice to the conversation. For anyone who works with other humans as the focus of their work (journalist, psychologist, anthropologist, sociologist, artist, filmmaker, scholar, etc. ), representation becomes of utmost importance. Does your work concern communication, engagement and observation, civic responsibility toward your surroundings and its’ inhabitants, representation of people unlike yourself? Please bring your voice to the conversation. An architectural work creates a phenomenological experience through a complex of sensory impressions intertwining light, sound, texture, and smell. Does your work concern architecture as expanded to include the bodies it affects, the perception of the body in public versus private space, architectural space as a register of memory and identity? Please bring your voice to the conversation. Regarding music as structural allows us to speak about sound in aesthetic terms – what happens when those structures are collages, assemblages, surreal, or illusory? Does your work concern illusion as it can be applied to auditory sensations, translation between sound & image, rational structures rendered surreal? Please bring your voice to the conversation. ‘Landscape’ oftentimes refers to the natural world as experienced from a human perspective, indeed as framed and defined by this specific point-of-view. Does your work concern human & landscape relationships, cultural landscapes, the environment as a framed, shaped or built space? Please bring your voice to the conversation. My Sister Hali, a documentary by Graphic Design Professor Paul Sheriff will be screened at the Temple Performing Arts Center, 1837 North Broad Street, Philadelphia, on Sunday, March 17 at 4 pm. Everyone is invited to attend. Prior to the screening Dr. Charles Abramovic and Heidi Jacob, will discuss the process of composing the film score. After the discussion, pianist, Dr. Abramovic and cellist, Jeffery Solow, both professors at the Boyer School of Music will be performing the music for the movie. My Sister, Hali tells the story of Hali Sheriff, an internationally acclaimed American athlete and front runner for the 1968 Olympic Women’s Gymnastics Team, whose promising life ended much too soon. It was early summer of 1966 when 14 year old gymnastics superstar Hali Sheriff was killed in a plane crash. All six passengers on board the small aircraft died, including Hali’s mother and coach, Virginia, and father, Harold Sheriff. Surviving brothers, Paul (10) and John (16), were not on the plane. This moving, character driven story of a gifted star gymnast, and the team that cherished her, is told through the resilient eyes of her younger brother, Paul Sheriff. After remaining silent for nearly 50 years, Paul opens up for the first time to revisit the magnitude of Hali’s career, the shock of her untimely death, the traumatic loss of both his parents and its everlasting impact on their small, midwestern community of Blue Mound, Illinois. The project has been the subject of numerous articles in newspapers throughout the county including the Philadelphia Inquirer. The film opened the doors for Hali Sheriff to be inducted into the World Acrobatic Society Gallery of Legends Hall of Fame in a ceremony this fall in Las Vegas Nevada. In conjunction with Women History Month, WHYY will feature the documentary on Sunday, March 24 at 6:50pm. 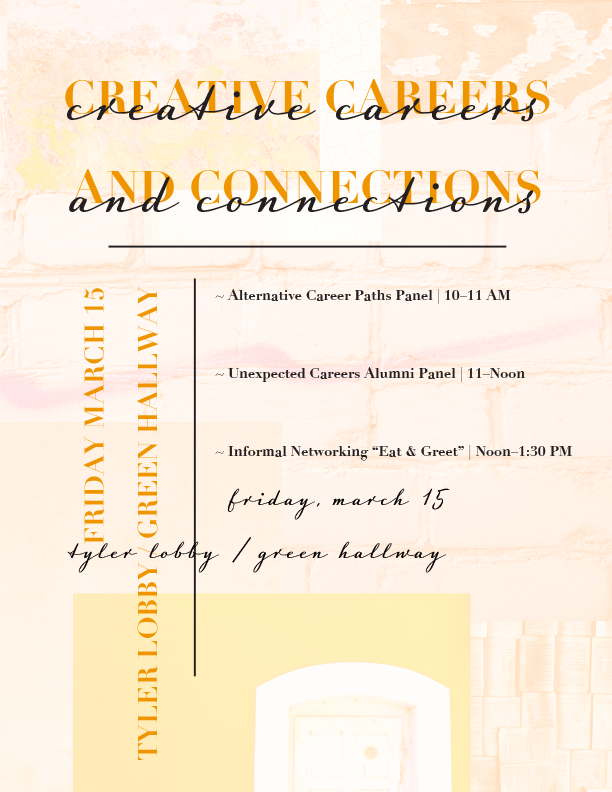 Join us Friday, March 15 for Tyler’s annual Creative Careers Day! Alternative Career Paths Panel. Have you ever considered that there are different paths than just getting a job after college? We’ll have a panel of alumni who took a different turn after getting their degree! Come and learn about ArtistYear (or CityYear or other post-graduate service), Peace Corps, and Fullbright Fellowships. Unexpected Career Panel. We will have a panel of alumni who will talk about unexpected things they did with their degrees. Your major is not your destiny! Come and learn how to shape your path to fit what you want to do with your life. Coffee, tea, and light treats will be served at the panels. Informal Networking. We’ll have alumni from many different kinds of organizations for you to network with. Some will be recruiting for interns and/or employees, so don’t miss this awesome opportunity to pick the brains of Temple alumni and figure out where you want to land after graduation. Create Magazine, CultureWorks, Mural Arts, Fabric Workshop, FringeArts, David Yurman, GoggleWorks, Philly Sports Digest, Clay Studio, URBN, and Wallingford Arts Center have all confirmed attendance. Cookies and lemonade will be served. This is an INFORMAL networking event. Paint-stained jeans are just fine. Bring your resume if you have one! 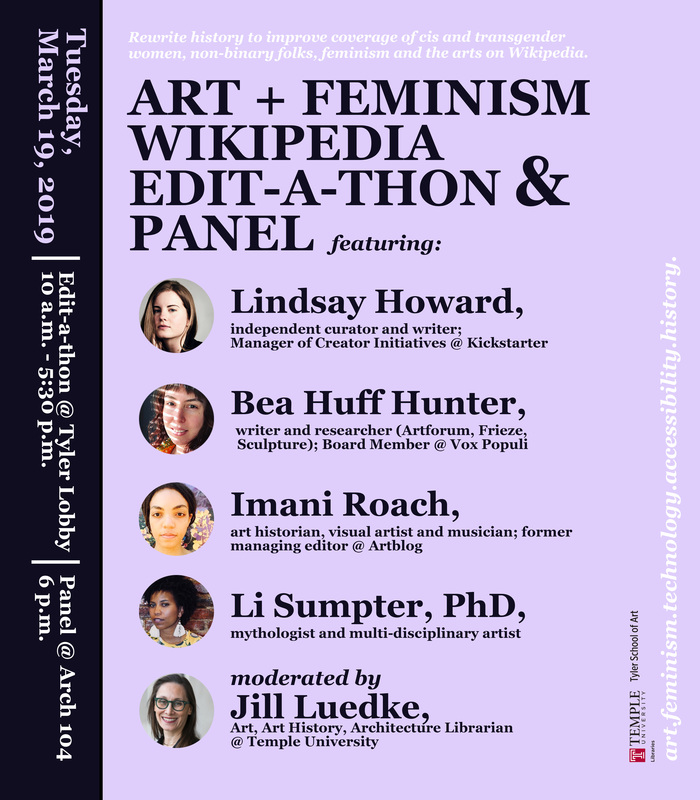 Rewrite history to improve coverage of cis and transgender women, non-binary folks, feminism and the arts on Wikipedia. All are welcome, feel free to drop-in for any portion of the day. 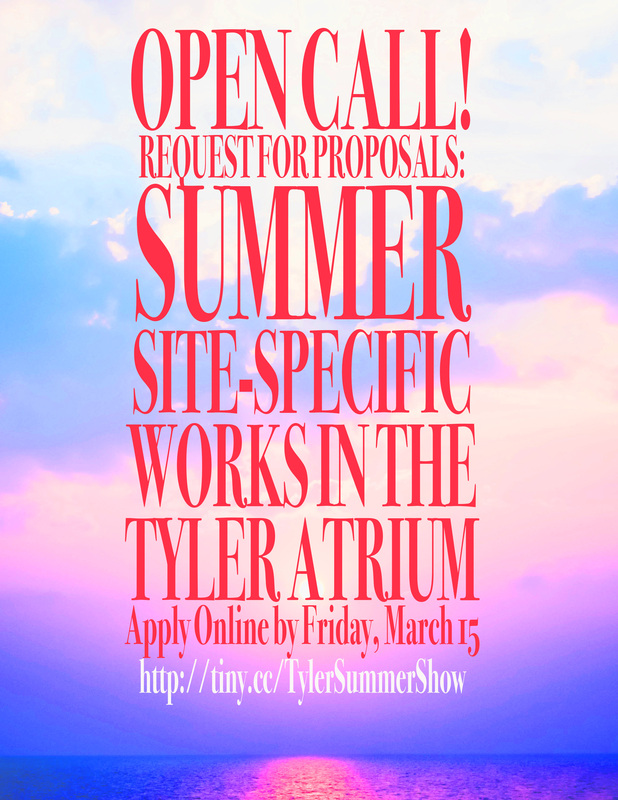 We are interested in proposals that consider the unique architecture and spatial opportunities of the 1st Floor Atrium space of Tyler! Tyler Grads + Undergrads are welcome to submit! You may submit a proposal as an individual, or as a group with a group leader, (see below for section for collaborator names). You must be available to install and deinstall your work on time, no exceptions!